Clan created 15-Jan-14 10:31, and membership is by invite only. This clan is where all CWS general staff members are listed. You cannot join unless you are a staff member. Likewise, if you are a staff member, you cannot leave this group; an administrator will need to remove you manually. If you need to contact a staff member to do with the site, please do; however, we recommend you use our Feedback / Report form. Please note that 'Admin Sheep' is not an actual member, but an entity to show where the system has automatically made changes. Any private messages sent to Admin Sheep (including replies) are not read. The same goes for 'Mama Sheep.' All other 'bots' are actually semi-automated entities, and may respond when contacted, but it is not a guarantee. @emma has been our lead developer since late 2016. She is responsible for fixing bugs and making everything runs smoothly, and also has a hand in CWS² redevelopment. @kwiatowa is the CWS² recode team leader. You can read more about CWS² here. While she's currently busy with school, we're still hoping for CWS²... someday. Our site administrators have full access to most parts the site, except some of the back-end coding. We are mostly here to keep things organized. Our duties include user moderation, simple troubleshooting, and authorising new staff members. Feel free to ask us for help with any site feature. While the Administrators all have access to each of these tools, specific staff members are officially in charge of each feature that needs moderation. If you need help with these, go to the associated staff member first. There are seven annual events, one monthly event, and one semi-random event on ConWorkShop, organised by staff members, for all to participate in. You can find out more about each event here. Although many staff members might pitch into the planning or running of the event, many have a lead coordinator. 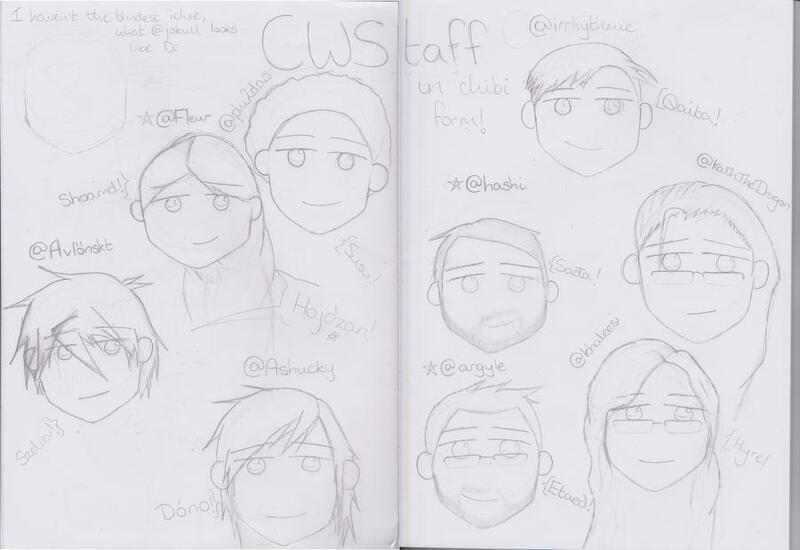 These are staff members in charge of the CWS Planet project, a collaborative conworlding project on CWS. Over the years we've had many staff members who had to step back from their duties for whatever reason, but we'll always be grateful for the help they gave. Thanks, guys — we couldn't have done it without you! What should August's event be? Should this poll be secret?